The latest in a line of interactive advertising campaigns for the current fifth-generation Polo, Volkswagen Denmark has launched ‘The Polo Principle’. What is it? The company says: ‘We take the newest technology, the highest quality – the innovations that were made for the elite – and make them available to everyone. Each and every part of the Polo works to give the power of innovation and quality to all.’ That’s all very well, but what’s more impressive is that way in which the campaign is being marketed. Users are invited to create their own Polo ‘prototype’, either by downloading a template to illustrate in Adobe software, or by using the online 3D designer. Using preset tools and icons, users can layer on designs and graphics or even upload their own. The realistic, fully interactive online modeller gives many views of the car, and can be rotated and spun, so all the car is decorated. 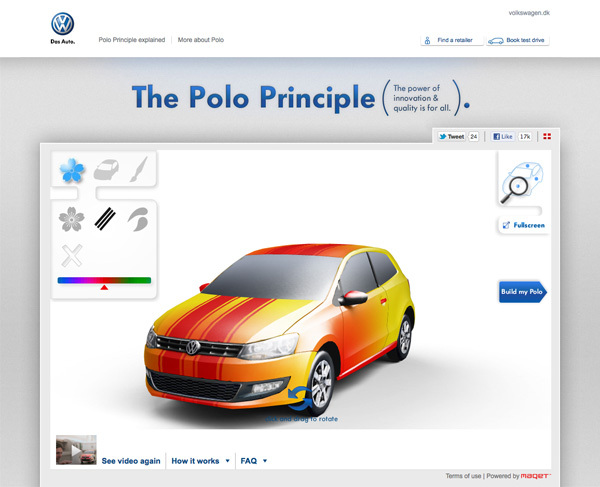 When complete, the user clicks the ‘Make It Real’ button and the finished Polo prototype is shown on the next page. By submitting a design, the user is effectively entered into a prize draw. Volkswagen Denmark will select the 40 most creative cars for clever plaster-based 3D printing, as shown in the video above. The successful creators will then receive a physical 3D prototype models of their design after they’ve been exhibited in Copenhagen in May. Finally, one lucky winner will have their Polo prototype turned into a real Polo (by way of a film wrap of their design we imagine), and will get to drive it for two months this summer.